The beginning of the NBA playoffs last weekend marked the end of a regular season that was both fruitful and frustrating for Denver Nuggets power forward Kenneth Faried. Last summer, the 6-foot-8 Faried helped Team USA win a gold medal at the FIBA World Cup in Spain, putting himself on the international basketball map with his fly-above-the-rim athleticism and dive-on-the-floor effort. Soon after the World Cup, the Nuggets signed Faried to a $50 million contract extension, seemingly cementing his status as a franchise cornerstone. The NBA itself also invested in Faried, casting the dreadlocked and fan-friendly “Manimal” — a practicing Muslim from Newark, N.J. — in more of its marketing campaigns. The 2014-15 season seemed like the right place and the right time for Faried to become a star. It started off with a bang, too, as Faried put up 22 points and 17 rebounds in an opening-night win over the Detroit Pistons. Then there was his 26-point, 25-rebound explosion against the Minnesota Timberwolves on Dec. 26. Other high spots included an 18-point, 19-board performance against the Chicago Bulls, 22 points and 14 boards against the Dallas Mavericks, 26 and 14 against the San Antonio Spurs, 24 and 17 against the Golden State Warriors, and a 19-point, 17-rebound stat line against the Los Angeles Clippers in his final game of the season. But between those peaks were plenty of valleys. And plenty of mediocrity. And now, six months after that promising season opener, Faried is pretty much in the same place he was before what was supposed to be his big breakout. This season Faried averaged 12.6 points per game (down from last season) and 8.9 rebounds (up from last season), shooting 50.7 percent from the field (down from last season) and 69.1 percent from the free-throw line (up from last season). The Nuggets finished 30-52 (worse than last season), missing the playoffs for the second straight year. Head coach Brian Shaw was fired in March and replaced by assistant Melvin Hunt, under whom Faried thrived in the final six weeks of the season. Some nights he was more Manimal than others. The net effect is an unsatisfying taste in what was supposed to be his breakout season. He has had to find some solace in finishing the season in the manner he wanted to start it. Faried admits he never felt comfortable playing under Brian Shaw — from his role to the wildly changing number of minutes played from game to game. There are very real coaching splits that illustrate how drastically things have changed for him under interim coach Melvin Hunt. In 19 games under Hunt, Faried is averaging 15.4 points, 9.7 rebounds and 1.1 blocks, shooting 52.5 percent from the field and 73 percent from the free-throw line. 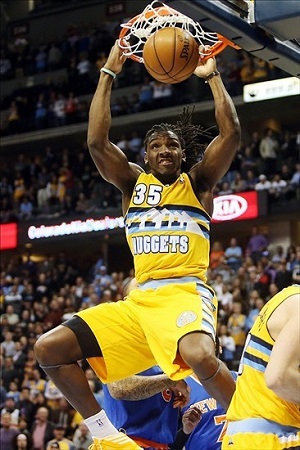 Under Shaw, Faried averaged 11.2 points (49.1 percent shooting) and 8.5 rebounds. There were many nights in which Shaw wondered aloud why Faried wasn’t bringing the energy he was known for. Faried, meanwhile, wondered why he couldn’t ever get on the same page with Shaw, and he said that took an emotional toll. Hunt has liked Faried’s present. Since Hunt has been the coach, Faried has played like the man who earned the big payday. Faried is simply looking a lot more like Faried. Faried has potential to be an All-Star and perhaps a 20-and-10 type of player. But at 25 years old with four pro seasons under his belt, there’s also a good chance that Faried already is what he is ever going to be in the league; that while he may have 10 good years ahead of him playing at his current level, he doesn’t necessarily have much more room for improvement. Faried is good enough and marketable enough to be the marquee name on a playoff team. But will he ever be the go-to guy on a good team who is expected to hit game-winners and carry the squad in crunch time, like Karl Malone and Charles Barkley and Kevin Garnett once were from the power forward position? On top of that, simply getting into the postseason with these Nuggets will be tough. The NBA’s Western Conference is loaded with good teams with solid foundations for the future and a superstar or two on the roster; the Nuggets have some solid pieces, they may be looking for a new coach this summer, and the only man on the roster who’s even made an All-Star team is aging backup point guard Jameer Nelson, who was named an All-Star one time back in 2009. The way the NBA is now, the Nuggets need at least two All-Star caliber players — ideally one legit superstar — to have even a chance at being a title contender. 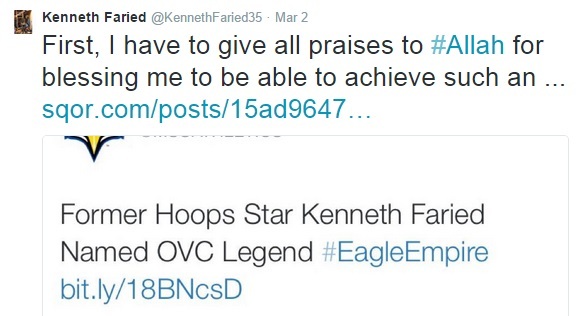 Kenneth Faried was supposed to grow into that this year. Now he, and they, will just have to wait until next year for a chance to try again.